You know you want Rolo Stuffed Peanut Butter Cookies today, right??? 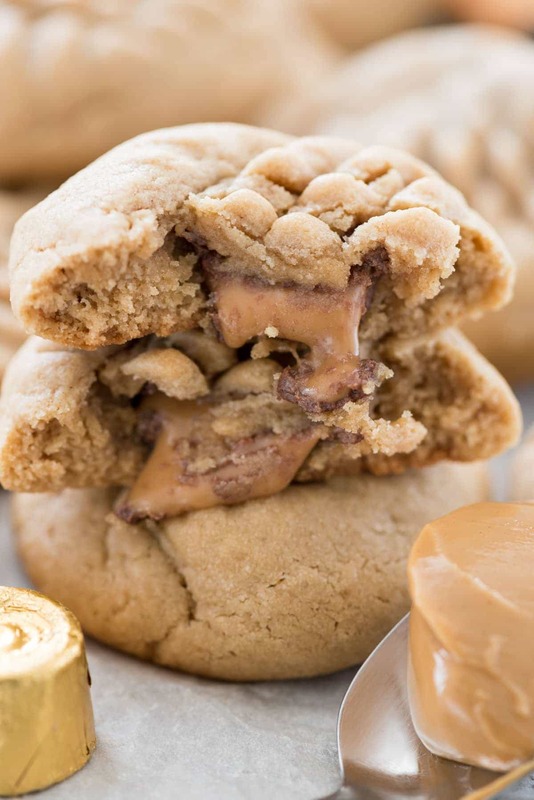 Rolo Stuffed Peanut Butter Cookies are my favorite and BEST peanut butter cookie recipe stuffed with a gooey Roll caramel candy. These are PERFECTION. Growing up, I never expected to live farther than five minutes away from my parents. After all, my Nana was about two minutes from my house, and my Grandma was three, depending on traffic lights. But life never really goes as planned, and we have landed about a two hour drive from my childhood home. I’m not complaining; two hours is much preferable to the 11 hour drive it used to take my parents to come visit us when we lived in Arizona. Plus a time difference, for six months (I really don’t get that, BTW). I’ll take two hours, no problem. The problem with being far away is that we don’t always get to celebrate birthdays on the actual day. And in my family? Birthdays are big. (Like you didn’t guess from yesterdays post.) Big with cake and candles and singing. Usually a dinner out, to a nice restaurant where you can wear your dressy jeans. Now, when it’s my mom or dad’s birthday, or it’s a holiday, we can’t always be there. However, I can’t let a birthday go without some sort of celebration, right? Since I can’t very well mail a birthday cake…I often mail cookies instead. Rolo stuffed cookies aren’t new, but they’re new to me! I’ve been wanting to make them for ages now. So I combined my favorite peanut butter cookie recipe with one of my mom’s favorite candies. 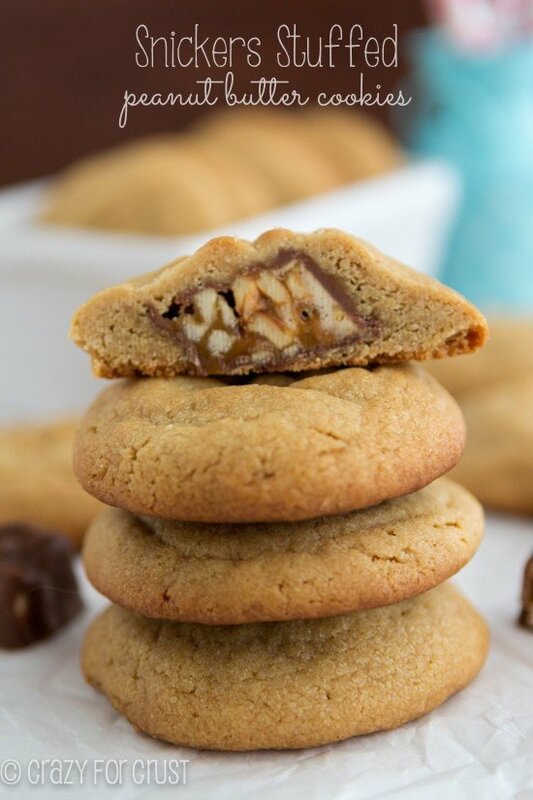 Peanut Butter Rolo Cookies are so delicious I can guarantee whoever you send them to will love them. I love that these peanut butter cookies mail so well. They package easily and ship easily and stay soft for days. But they’re not just good to mail; they’re good at home too. Making Rolo Stuffed Peanut Butter Cookies is EASY! Scoop up some peanut butter cookie dough. Then add the criss cross fork marks like peanut butter cookies always have. 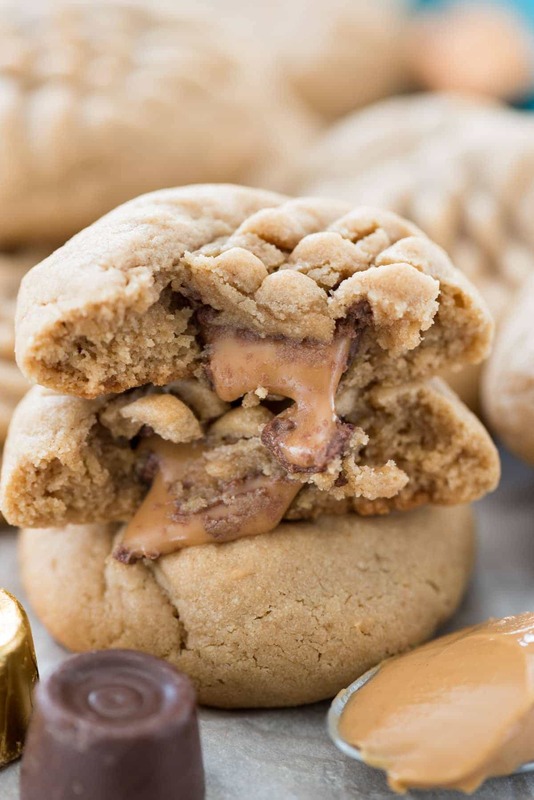 You must start these with this peanut butter cookie recipe though – it’s the BEST one ever. What makes the best peanut butter cookies? Peanut Butter – obviously. Use your favorite kind! Brown sugar keeps them soft. An egg keeps them chewy. Some milk keeps the dough soft without adding another egg. Even if you don’t stuff these cookies with Rolos, they’ll be peanut butter cookies everyone loves to eat! Scoop 2 tablespoon sized balls of dough. Wrap a Rolo completely into the middle of each ball, rolling it between your palms to seal. Place 2” apart on cookie sheets and use a fork to make a small criss-cross pattern on the top. Bake for 9-12 minutes, until they just begin to brown. Cool completely and remove from cookie sheets. To get the gooey caramel in the photos, eat when warm! Click here to see more PEANUT BUTTER COOKIE recipes! And I absolutely love Karen’s Peanut Butter Oatmeal Cookies, these peanut butter cookies dipped in chocolate, and Cheryl’s Gooey Butter Peanut Butter Cookies! 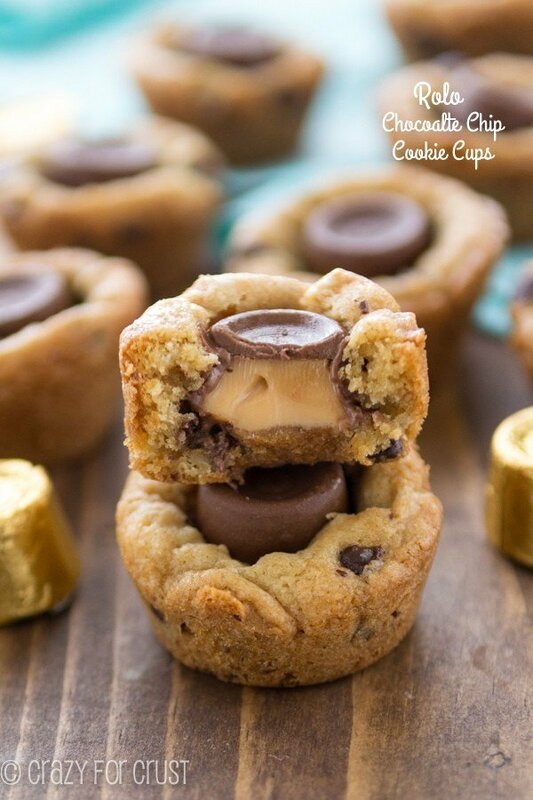 Rolo Chocolate Chip Cookie Cups use Rolos in another cookie! 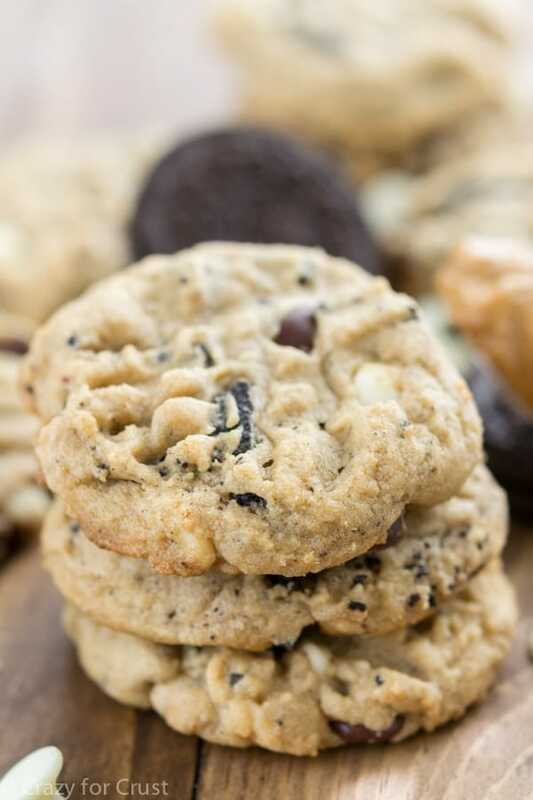 Cookies ‘n Cream Peanut Butter Cookies are stuffed with OREOS! Snickers Stuffed Peanut Butter Cookies because a Snickers always satisfies. Rolos are one of my favorite candies…and then there’s cookies too! Combine the two and I’m thrilled. These look divine. MMMM! Dorothy — can I pre-make the batter and then freeze it make later this week? I’m trying to do a bunch of prep work before we leave for camping. I just made this and blogged about it except I stuffed it with peanut butter cups – they were great! Thanks for sharing the recipe. These look good. It is nice that birthday’s are a big deal for your family! One tablespoon vanilla? Or should it be one teaspoon? Any help would be appreciated! I love rolo stuffed ANYTHING!!! I’ve actually eaten a ton lately because my husband brought a bunch home from work (why??) Now I need to make these cookies!! These are perfect! Few things are more tasty than PB, Chocolate, and CARAMEL! These look great! I don’t understand mailing them, if they only last 3 days. It takes 3 days to get them to some places, so do you overnight them? I can’t stand the thought of sending my loved one cookies that are already old, or will only last one day when they get them. I have never mailed cookies, so help me out here. I would love to do that, but I didn’t know how fresh they would be when they arrive. Thanks!